I love the culture of prewedding photoshoots. I think its any brides dream to have an official photoshoot with her hubby to be. The idea behind a prewedding photoshoot is to have fun, create tons of memories and share the love. But every once in awhile, I come across couples photography that truly resonates their love across. I was working on the last post on spring colourful prewedding photoshoot props, when I came across Rohan & Aakshi’s fun baking themed prewedding photoshoot. An activity based prewedding photoshoot. Its quite genius. I know a lot of couples who face the issue where the girl is more than happy to pose, but the boy is shy and basically not too gung-ho about pictures. What happens then is that a lot of times, the pictures look forced upon, and they don’t come as candid as one would have hoped for. Not even the best photographers can help solve that problem. 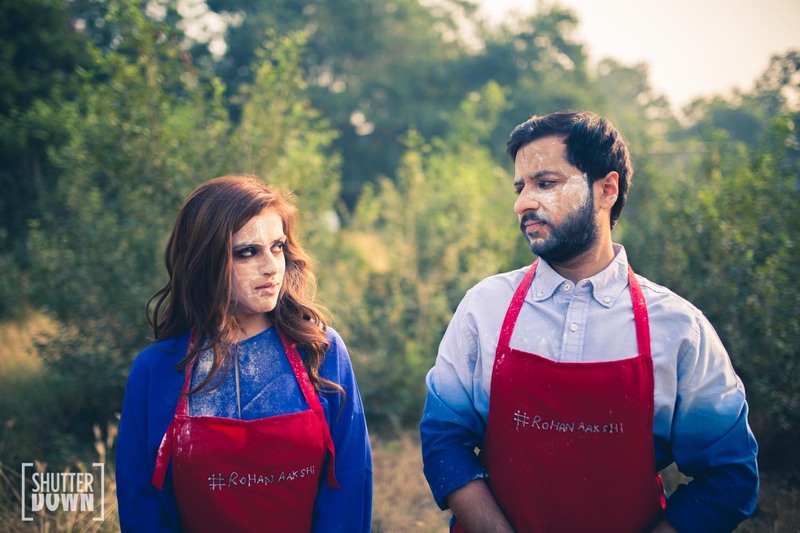 What is a baking themed prewedding photoshoot? Rohan & Aakshi wanted something different than the usual prewedding photoshoots that we see every other couple doing. Aakshi was always passionate about baking, while Rohan was a newbie in the department. So they decided to have a fun outdoor baking picnic program and decided to shoot the process. Now that’s something you can expect from boys – to fiddle around in your kitchen and try out risky tricks. I love that the couple is not trying hard to pose or anything, they are just being them. Silly, young in love and totally adorable. There is actual baking involved, they are trying to get it right, while playing with each other all along. Special mentions need to go to their photographers at Shutter Down Photography for making them feel so comfortable and at ease to be goofing around so effortlessly. Forget the cameras, forget the poses. Just pretend no ones around. Sigh, if only it was that simple. But that’s what activities are here for. It gives you the excuse to immerse yourself in the project in front, rather than obsessing about what to do, how to pose, how to smile etc etc. Candid, it is. You don’t need to go ahead with the baking theme only, you can think of anything that you as a couple might enjoy. May be choose a different route like Rohan and Aakshi and try out an activity in which one is good at, and the other is totally clueless. You will be amazed at how much fun and how effortlessly your prewedding photoshoot pictures turn out. I can’t pick my favourite picture from this prewedding photoshoot. Every picture has so much to tell. You can instantly connect with the emotion running through the couples minds. Oh, and it looks so so much fun. You almost come to know the couples personality around each other, and there is something so endearing about it. What did you think about this photoshoot? Loving it, aren’t you?